With 35 million or 45 percent of American dogs overweight or obese, putting your pooch on a diet might just be on the cards. Do you know if your dog needs to lose weight or are you still calling it "puppy fat"? While owners are busy spoiling their canine friends with treats, extra food, and cookies as a show of love, the reality is that an overweight dog is neither happy nor healthy, and if your dog falls into this category, it's time to fix it, immediately. How To Know If Your Dog Is Obese? If you’re not sure, pat your hands along your dog’s sides from head to tail. In a healthy-weight dog, you should be able to just feel the ribs. Also, take a look at your dog from the side. Most dogs should have a slightly “tucked up” profile. If all you feel are fat pads on your dog’s sides, or if his side profile is more sausage-like than sleek, chances are your friend may need to shed a few. The first thing you should do is get your vet involved. Take your dog for a checkup as there are underlying conditions that can contribute to obesity, including diabetes, Cushing’s disease and hypothyroidism. Have your veterinarian determine your dog’s current and ideal body weight and then tell you how many calories your dog can eat each day in order to reach that ideal weight. Your goal should be to work toward that ideal weight over a several-month period. An above-ideal score in a body condition assessment. Dogs should not be fed “free choice” as they tend to eat when bored instead of when hungry -- which contributes to ever-expanding canine waistlines. Dogs should be fed two to four times each day, and all food portions should be measured exactly with a standard measuring cup. Dog food label recommendations must be used cautiously. These guidelines are generic and most likely represent overfeeding for many U.S. dogs. 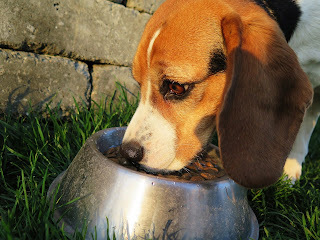 Dogs must be fed according to their ideal body weight -- not their current weight if they are obese. If your dog is even mildly overweight, feeding according to the recommendations found on the food bag will result in continued weight gains. Eating right and being physically active aren’t just a “diet” for your dog -- they are keys to a healthy lifestyle and will reduce your dog’s risk of chronic disease and increase his chance for a longer life. Too much strenuous exercise can be a hazard for your dog. Talk with your vet about how much exercise your dog should be getting. 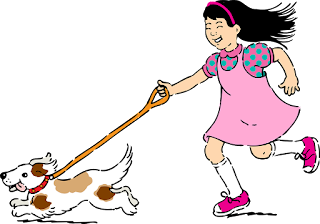 If you make exercising the dog a task for your kids, make sure that they know how to properly walk a dog, help her when she is hurt, etc. Make sure they bring water for the dog. Also, if you have a young child, always have an adult accompany them on walks to avoid danger. Always research foods before giving them as treats to your dogs. For example, grapes, raisins, chocolate, and onions can be very toxic to dogs. Never restrict access to water; it should always be clean and freely available unless a vet requires otherwise. A dog that is left outside during winter needs double the usual amount of high quality dog food. 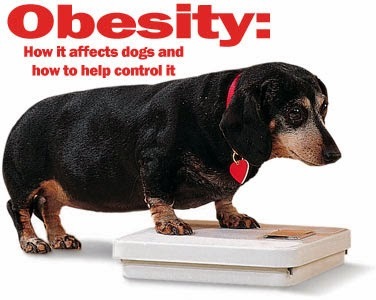 Talk to your vet about any issues this might cause if you have an overweight outside dog.